I browse through groupon everyday like a housewife in search of great deals. They have some pretty surprising items that are worth buying at times, case in point, I found them selling a cuisinart ice cream maker for S$200. I pounced on it. This was my first creation, one of the best sorbets, and possibly best sorbet Ive ever had in my life was the earl grey tea sorbet at Guy Savoy, which I first tasted at Guy Savoy paris. There arent many things as refreshing and versatile as it, as a palate cleanser, at the end of a heavy meal, it is delicious either way. When I eventually ended up staging at Guy savoy Singapore a few months back, I used to pray that the dessert station would have extras, but alas, the only ice cream I got to try during my time there was a strawberry ice cream. Nevertheless, I wanted to attempt to replicate the sorbet at home, and the moment the Cuisinart was delivered, I knew this would be my first creation. The sorbet failed on my first attempt, it wouldn’t set up and didn’t even get to a slushy point. I started troubleshooting and concluded that my freezer wasn’t cold enough. I reattempted the sorbet a couple of days later, churning the ice cream in my air conditioned bedroom(Singapore is incredibly hot). It worked, the question was what to serve it with. The make up of the sorbet is simple- earl grey tea, sugar, lemon juice(I added a little leftover yuzu as well), pinch of salt. Serving it with a lemon curd seemed glaringly obvious, the curd providing a creamy mouthfeel that the sorbet would quickly wash away, as well as reinforcing the lemon flavor. It was perhaps a fortunate coincidence that just a week ago, I attempted to make Christina Tosi’s(of Momofuku) arnold palmer cake, and one of the components of the cake was an almond tea crunch(feuilletine, almond butter, powdered sugar, iced lemon tea powder, toasted almond slivers), it was truly one of the most delicious things Ive ever put in my mouth. I could spoon that tea crunch directly into my mouth over and over until I reel over from the amount of sugar. This was another obvious addition, crunchy, nutty, and backing up the tea-lemon flavor, a winning combination. 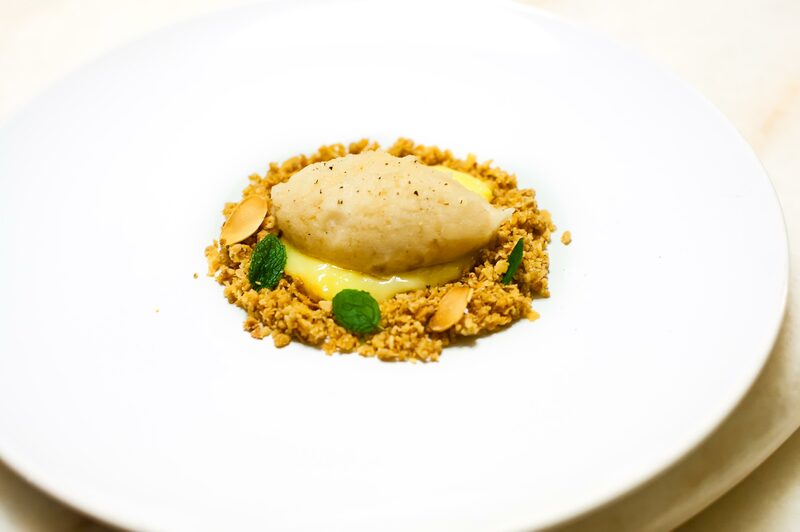 can you provide the proportions for the sorbet, or did you just follow the Cuisinart’s recipe book? Thanks!